Pros from the far reaches of the less traditional fighting game community descend on Orlando, Florida this weekend to make sacrifices to that tree dude from Kirby. 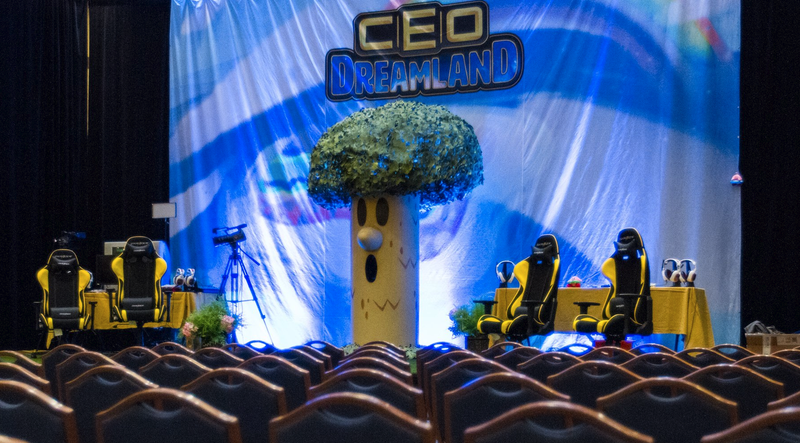 CEO Dreamland is the first event of its kind dedicated to brawl-style fighters and will give top talent across games like Melee and Smash 4 (Wii U) a chance to hone their skills and prepare before one of the premier fighting game tournaments of the year: CEO 2017. But that’s not all that’s going on. Below you’ll find where and when you can catch all the weekend’s biggest events in competitive gaming. Let us know what you’ll be watching in the comments or if you think there’s something we might have missed. This weekend in the Smash world all eyes on are CEO Dreamland. The event will feature top tournaments across all the games, including Smash 64, Melee, Brawl, and Smash 4. Thinks start today at 10:00AM EDT with singles brackets for Smash 4, Melee, and Brawl, while singles for Smash 64 start at 12:00PM EDT. Top 48 play in both Smash 4 and Melee will kick-off around 6:00PM EDT. A list of all the streams, including for tournaments featuring Brawlhalla and Rivals of the Aether, can be found here. You can watch the Melee bouts in the stream below. Fight Pitt 7 is also going on this weekend in Pittsburgh, Pennsylvania. The regional tournament began this morning around 9:00AM EDT with the top 8 bracket for Melee scheduled to start around 8:00PM EDT. Those matches can be streamed here. The League of Legends spring play-offs continue this weekend with the semifinals. First in Europe there’s G2 Esports vs. Fnatic at 11:00AM EDT today, followed by Unicorns of Love vs. Misifits on Sunday at the same time. In North America, Cloud9 vs. Phoenix1 at 3:00PM, while Team Solo Mid and FlyQuest play each other at the same time on Sunday. Overnight in South Korea, it comes down to Samsung Galaxy vs. Kt Rolster to see who will go on to face SK Telecom1 in the finals next weekend, while in China regular season play concludes with NewBee vs. Game Talents at 1:00AM EDT, Vici Gaming vs. Team WE at 4:00AM, and QG Reapers vs. Edward Gaming at 7:00AM. You can find all of the matches streaming live on each region’s respective channel (NA, EU, China, Korea). Summit 7 qualifiers for the Souteast Asia region will continue Sunday morning at 3:00AM EDT with HappyFeet vs. WarriorsGaming.Unity. The winner of that series will then face Clutch Gamers in the finals at 6:00AM EDT. You can watch those matches here. Meanwhile in the qualifiers for the StarLadder i-League Invitational, everything has come down to iG Vitality vs. Invictus Gaming at 5:00AM EDT Sunday morning, followed by the winner going on to face Vici Gaming in the finals at 9:00AM EDT. Those games will be available to stream live here. Capcom’s Norther California 2017 Regionals are going on this weekend with pool play beginning at 1:00PM EDT and going until 8:00PM EDT. On Sunday, top 8 play begins at 6:00PM EDT. Reigning champion NuckleDu will be playing along with with the likes of PR Balgrog, Tokido, Haitani, and Daigo. A full bracket is available here. Season 3 of the Championship Series for CS:GO started yesterday with play continuing this weekend across both Europe and North America. Astralis and Virtus.Pro started the day at 9:00AM EDT with matches starting state-side at 2:00PM EDT with Counter Logic Gaming vs. OpTic. Matches will go up and through 5:00PM EDT. On Sunday, Mouseesporst kick things off against Team Dignitas at 9:00AM EDT, with Luminosity vs. Renegade closing things out at 5:00PM EDT. A full schedule is available here, with the games streaming live on YouTube. The Red Bull Team Brawl event returns this weekend with teams given a random pool of cards with which to construct a deck for each of their three players. Play kicks-off today at 3:00PM EDT. Heroes of the Storm returns from its bye week with TF vs. SSS at 5:00PM EDT this evening, followed by NT vs. TS afterwards. On Sunday, NT play NVT at 5:00PM EDT and T8 vs. TS at 7:30PM. The World League is back at it again this weekend in Birmingham at the Insomnia Gaming Festival. The $50,000 event will comprise nearly a hundred teams and can be streamed live here. The spring Rocket League Championship Series returns after last weekend Mayhem break. Games start today at 3:00PM EDT with G2 Esports vs. Radiance, concluding later in the afternoon around 7:00PM EDT. On Sunday, the action switches to Europe with Flipsid3 Tactics vs. PENTA beginning at 12:00PM EDT. Those games will all be streamed live here. The Spring Gauntlet tournament began yesterday and resumed today at at 11:00AM EDT. The games are broken up by region, with the finals for both EU and NA scheduled to take place on Sunday starting at 11:00AM EDT. first-place for each continent walks aways with $10,000.